Jun. 28, 2013 10:00 a.m. 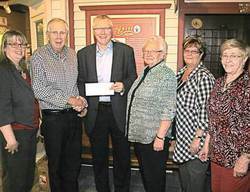 Representatives from the Millet Museum and Millet Council gladly received a cheque from MLA Verlyn Olson for $10,145.00. This money from the Provincial Community Initiatives Program will help to make the museum more accessible by installing power assist door openers and a new stair chair.